“I see thou art new in these parts. Have ye come to join?” he asks. And so another assassin is born. As a teen I thought this was a fun way to begin a game. The archaic grammar, the Latin spell, the medieval setting, everything. 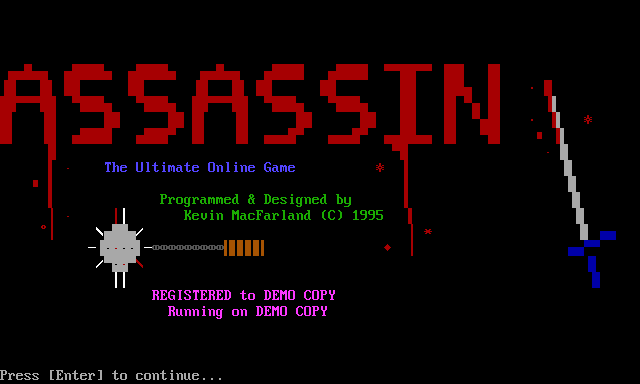 Many years later, I still find Assassin by Kevin MacFarland a great game to play. Assassin is a role-playing game in which you create a character who has various attributes and skills which you can enhance over the course of the game by earning and using training sessions. Your goal is to kill and rob your way to the top of your profession. Assassin was meant to be a social game. Players could join guilds and work together, or fight each other in locations around the medieval city, such as the back alley. The asynchronous nature of BBSing in those days meant that during such an encounter, the other player’s character would be controlled by the computer. I first encountered Assassin on Flash BBS in St. Louis, which is appropriate. Flash was an Atari ST BBS, and Assassin began as a door game for Atari ST BBSes. In previous posts, I have described how my early BBSing years coincided with both the zenith of BBSing overall, and the end of Atari BBSing in my town. The Atari computer platform was being abandoned in favor of PCs. So at the time I first played Assassin on Flash, there were other players, but not enough for the game to be highly social. I never got to participate in a guild-sponsored bank robbery, for example, which sounds like it would have been pretty exciting. Still, I had a great time trying (and failing) to kill players in the pub, robbing NPC citizens on the street, or digging up the corpses of other fallen players in the graveyard. The latter is an example of one of Assassin’s delights: lots of surprising features. The alchemist would usually offer you a “mystery potion,” but if you kept visiting after a while you might get lucky and he would offer you the good stuff instead. On certain turns, new options would become available, like the option to go to the graveyard or to visit the “mystic seer.” The idea I could dig up a fellow player (who was “dead,” having been defeated in combat) struck teenage me as really cool. Appropriately, Assassin plays a lot with the concept of death. When you die, you are offered the chance to be resurrected. If you accept, a familiar cloaked figure will chant Latin and you will be revived, but with diminished abilities. There were quite a few RPGs similar in tone to Assassin on BBSes in those days. The best-known, of course, is Legend of the Red Dragon. But I think Assassin still stands out today. One reason is the great gameplay balance. Starting out, there are a lot of things you can try, but the choices aren’t overwhelming or unclear. I find I can have success early on, and this makes me want to stick with the game. But even if you have trouble in the beginning assassinating players or NPCs, you can instead try to make money by robbery and save up to buy better weapons — or you can luck your way into a windfall by playing games of chance. That same balance can be found in combat. There are plenty of options (and strategies) available to you during combat, which can make it into a “key mashing” affair. But then again, Assassin offers to automate combat for you if you want. Assassin did not remain an Atari-only game. MacFarland ported it to the PC, where a larger group of BBSers could discover it. And it is still being played to this day. In fact, just this afternoon I logged on to Dark Force BBS and found a player called “C Monster,” whom I proceeded to kill (and later dig up in the graveyard). As you’ll learn in tomorrow’s interview, “C Monster” is Kevin MacFarland’s alter ego. I killed the game’s creator! I might be in trouble. Want to try playing Assassin right now? Some BBSes still host the game. Here are a few. You will need a telnet client like SyncTerm. Leave a comment and share your own Assassin memories. ALSO: Come back tomorrow for an interview with Kevin MacFarland. This entry was posted in Door game memories and tagged assassin, bbs, door games on Sep. 4, 2013 .